Thank you for giving Pro Pumping & Hydrojetting the opportunity to introduce ourselves. Pro Pumping is a family-owned and operated company that has been in business in mid-Missouri for over 40 years. 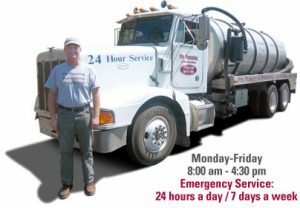 We offer septic tank pumping, grease trap maintenance and cleaning, hydrojetting, lagoon draining, and camera inspections. Our courteous and professional staff is here to help you. Call us at 573-474-5489, Monday through Friday 8:00 am – 4:30 pm. We also offer emergency service and are available 24 hours a day, 7 days a week. Septic tank pumping is a vital part of maintaining your septic tank system and can save you from costly future repairs. We offer lagoon drainage services so you can take care of bank repair and other maintenance tasks. Regular grease trap maintenance can prevent unnecessary back-ups, and in many areas it’s a health code requirement. High-pressure hydrojetting can clean pipes and cut through blockages saving you from expensive repair or replacement. We use our sewer camera to diagnose blockages and leaks in your lines. We can also locate septic tanks and inspect the interior of septic tanks and grease traps with camera diagnosis. Our equipment can view up to 100 ft of drain line that’s 4 inches in diameter or smaller. This can help detect roots in the lines, broken pipe or other blockages in drain lines. Give us call to set up an appointment for this service.